we did not speak about love. Instead we spoke about hands. Some of them would be warm. Some of them would be violent. We did not speak about violence. Instead we spoke about clouds. It did not rain at all that day. It did not rain much that year. It was the most arid decade ever. We gave in to internal liquids. Instead we spoke about history. A hundred years since the flood. See that building? we would say. Everyone who lived there drowned. and we were not surprised. they made us want each other. debate while we were away. to watch the midnight sun. answered, but spring is here. the ones who don’t return. asking where it came from. there were no guests left. knowing its country of origin. but the rain never came. to change their names or faces. have their bodies replaced with air. scaring up a flock of seagulls. that may or may not be of significance. There is a lot more to add to this. We are figuring out how to say it. we were late for November. everything else was late, too. I wanted to sleep with you. Christmas. Did we watch that movie? I quit smoking, but it was a mistake. They were trying so hard. We, too, should try harder. time is such a frozen little thing. We could crush it, I guess. If that would change anything. her sweater lost its scent of rain and wood. gave birth to a tiny creature in Suburbia East. to die. They all wore one-colored sweaters. we did not know what else to ask: What color? beach, lying face down in the ignorant sand. after all, but we did not speak about love. Gisle Skeie (born 1974) lives in Norway. Theology, Literature, and Philosophy studies at the University of Oslo. Works in a non-profit organization concerned with international Human Rights issues. 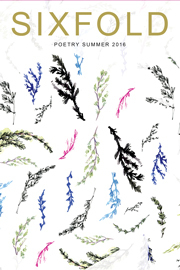 A handful of his poems have been featured in Little River and The Writing Garden (both US). Some of his poems and song lyrics in Norwegian (as well as music) have been published/recorded/broadcasted nationally.